‘Wonderful setting’: the opera was performed in Stoke Newington’s Old Church. 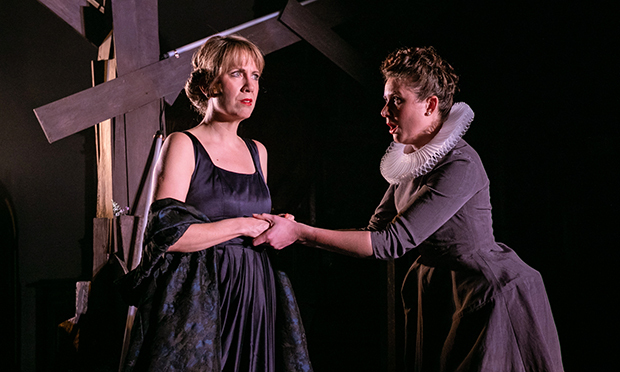 To celebrate its 10-year anniversary, theatre company OperaUpClose is staging Gaetano Donizetti’s Maria Stuarda – or Mary, Queen of Scots in English – in London’s last Elizabethan church. Through the exciting proxemics, clever dramatic choices and some raw talent, the show and its setting combine to create a magical evening of opera. Site-specific shows normally send a shudder down my spine as I remember tramping around Battersea in the rain, watching people in Victorian costume loom out of doorways next to a Nandos. But when done correctly it can elevate a show to something more akin to a historic artistic experience. In the wonderful setting of The Old Church in Stoke Newington, the singers’ voices reverberating with intense frequency off the 500-year-old stones, we delve into the stormy story. With a simple yet effective set, the actors seem to float on a sea of reflective silver – if all site-specific pieces had this beauty, I would be less apprehensive. Aesthetically it isn’t all plain sailing. 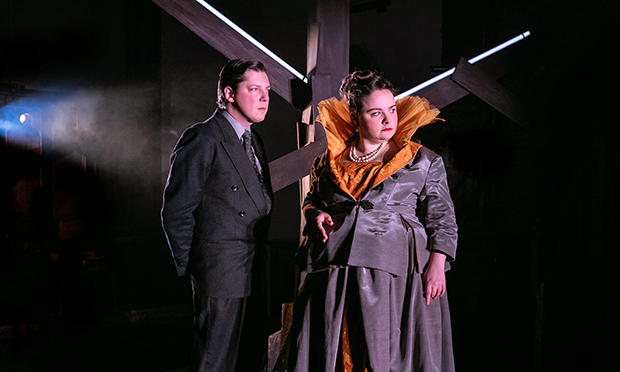 Although Kate Lane’s costumes are sumptuous, the messy mix of 1940s and Elizabethan proves to be a confusing thorn in the side of an otherwise electric evening. Following the later years of the life of Mary Stewart and her relationship with her cousin Queen Elizabeth I, this opera is in an interesting antithesis to the recent film based on the book by John Guy. Maria Stuarda takes a more classical view of the rivalry of the two women. Although the hatred and resentment of the two queens trapped in their fatal game is dramatic gold, I do find the attempts in both the film and the book to soften these iconic women more interesting. The age-old “this country isn’t big enough for the both of us” narrative seems overly simplistic. Unlike Donizetti’s better-known comedies, this is a rich and heartbreaking opera, swelling with high stakes action and music that is, by degrees, aggressive, harsh and gently submissive. The English translation at times feels a little clumpy, but for the majority of the piece the ability to understand the words outweighs any rhythmical awkwardness. Jan Capinski and Philippa Boyle, who ‘steals the show’ as Elizabeth. 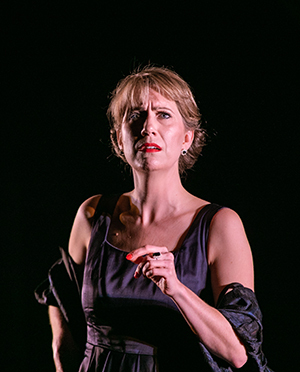 Philippa Boyle steals the show with her perfect depiction of the haughty Elizabeth, her soaring unmiked soprano filling the space with such power. Unfortunately in comparison Flora McIntosh’s Mary, although vocally impressive, lacks the graceful gait and famous pride the story demands of the titular fallen queen. Her mezzo intertwines with Boyle’s tone perfectly but the difference in their physical acting is glaring. Despite some slight difficulties with diction, the rest of the cast provides some rousing group scenes which build the tension in this intimate space. Cliff Zammit Steven’s Lord Leicester stands out in this female-dominated story. Donizetti’s classic use of bel canto, a vocal style that originated in Italy, shines in this second of his three historical Tudor operas – commonly referred to as The Three Queens. The real joy of this production is the inclusivity and engagement the company provides. OperaUpClose really does provide a revolutionary way of viewing this at times distant art form. Despite some curious visual choices and a few disappointing performances, this story of the pressures of female rule bounces off the columns and stained glass windows of a church that survived the period in question. The transcendent nature of theatre is very much alive as Donizetti’s music drifts out into the skyscrapers and busy streets of modern London. Maria Stuarda is on until 13 April at The Old Church, Stoke Newington Church Street, N16 9ES. It will then move to The Charterhouse, Charterhouse Square, EC1M 6AN from 24-29 April.